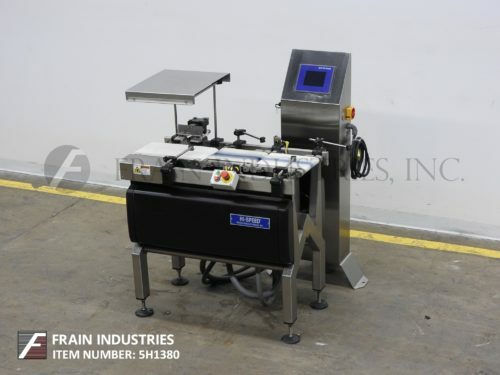 Loma Model CW3 6000M, inline, left to right, 304 stainless steel construction checkweigher rated from 60 to 100 packages per minute – depending on materials, application, machine configuration and environment being run in. Weight range: 500 to 6000 grams. Accuracies + / – 0.30 gram. Operating temperatures from 0 to 40 Deg C. Equipped with 19-3/4" long x 15-3/4" wide in feed, 19-3/4" long x 15-3/4" wide load cell and 28" long x 15-3/4" wide discharge anti static conveyors with single air ram arm reject, reject collection bin and status light bar. Control panel has touch pad controller with readout, start, stop, e-stop push buttons and data retrieval is capable via USB, Ethernet, Enet and Tracs. Mounted on height adjustable (4) leg base frame.